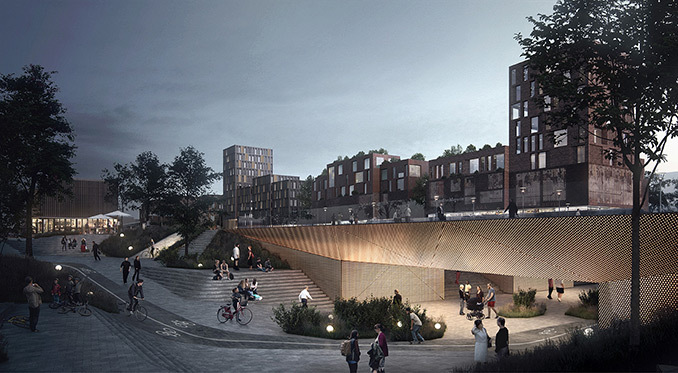 karres+brands together with EFFEKT, WTM, Arup and ALECTIA, made the winning proposal to redevelop the station area of Roskilde. 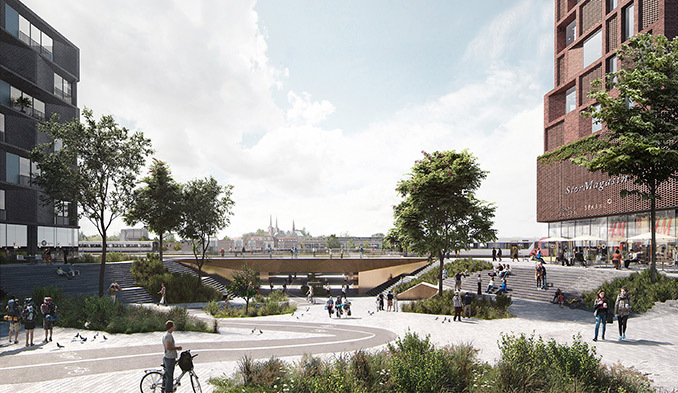 The 3,5 hectares sized competition area between the railway and Ny Østergade is to be developed into a vibrant, attractive and sustainable urban area that can serve as a bridge between the northern and southern part of Roskilde City, and contribute to a vibrant centre. A total of about 100.000 m² of new public, residential and office program will replace the currently parking dominated area. 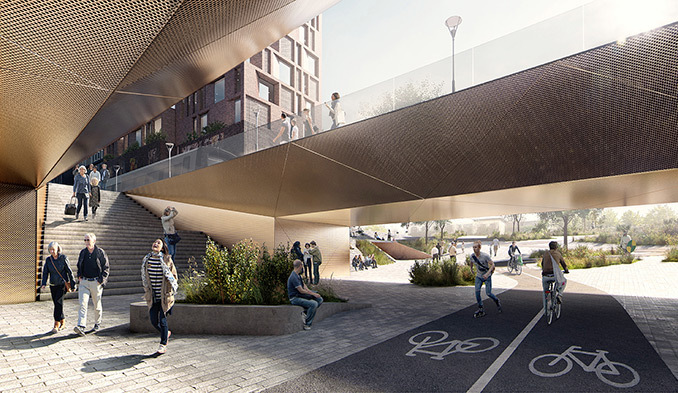 Our proposal explores the potential of infrastructure to become fully integrated in the existing city fabric and act as a driver for vibrant urban life. We propose using the new program to completely redefine what the station is. By opening up the public space to the railway we generate together with the new functions a different type of station. From a static building to a vibrant station area! A porous urban fabric which maximizes accessibility and brings together two previously separated parts of the city. Infrastructure can thus become completely integrated in fabric of the city. The station is the city and the city is the station! 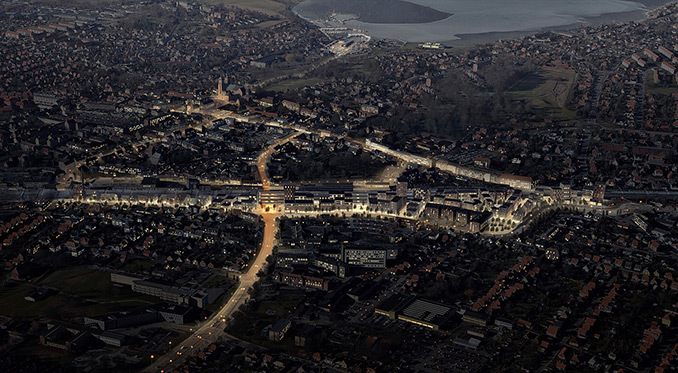 Central to our proposal is the gesture of seamlessly connecting two sides of Roskilde with a sunken public square. With maximum openings for daylight the railways become a series of bridges; pergola like constructions above the square. Patches of green animate the crossing making for an open, light, and friendly connection that brings the park and green structures in the south all the way into the city center and further down to the waterfront. Towards the extremities of the site, a mix of offices, small shops and housing react to the scale and character of the surrounding neighborhoods. Together with strong necklace of public spaces along the Ny Østergade they act as a membrane binding the new and old together in a context grounded development. 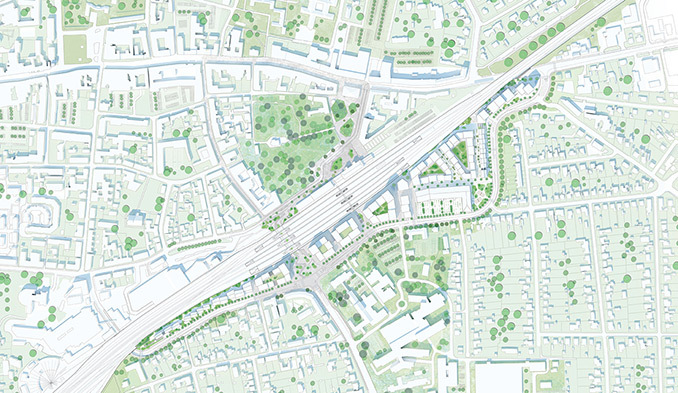 The biodiversity and micro-climate became the key elements of landscape strategy for Ny Østergade. Green network stretching from west to east has been reinforced by well integrated rainwater collectors which help to manage water balance of the side and potentially support climate change mitigation in the future. A low vegetation and shrubbery alongside of the railway track does not only complete the vibrant ecological backbone of Ny Østergade, but as well serve as a noise barrier and help filter and purify polluted air. 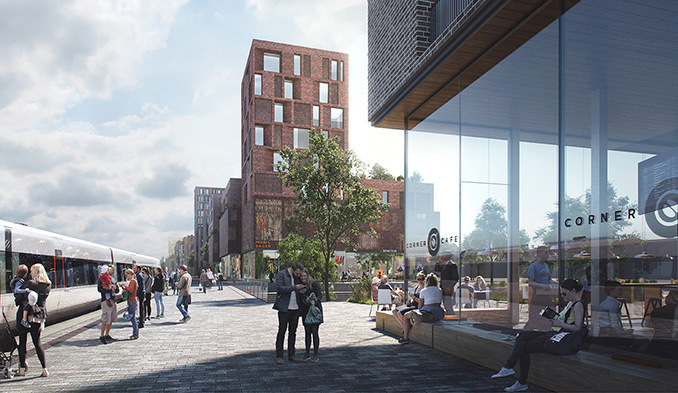 The series of new public places, as food market, playground and sports fields, are supplemented by small lush parks at far east and west point of Ny Østergade.